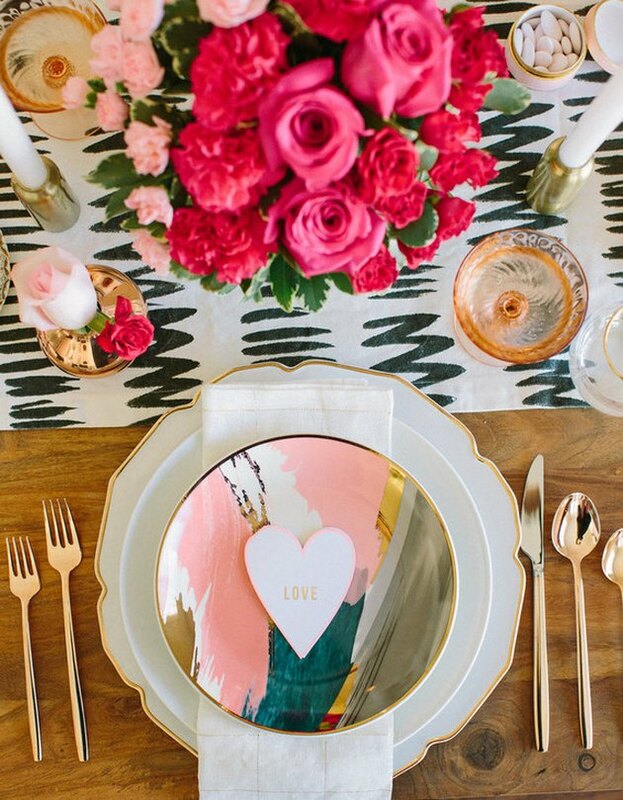 Whether you're planning a romantic fete for two, or a festive brunch with your closest gal pals, decorating for Valentine's Day can feel like a complicated affair. You want to set the right mood — creating an intimate affair that expresses just how much you care, without using those chalky heart-shaped candies to spell it out. Does anyone ever eat those things? Regardless, this year you can rest easy. We've found 13 stunning tablescape ideas that promise to give you and your guest of honor all the feels, filling your dining room with love and romance. 1. You can never have too many flowers. Bold love is the best kind of love — and the same could be said for this tablescape by Freutcake. 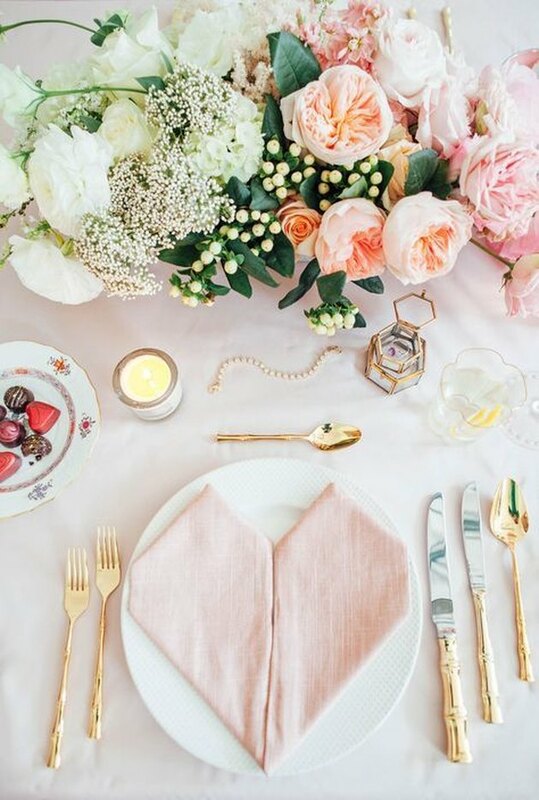 For her gorgeous Galentine's Day brunch, Leah combined fresh blooms, including a centerpiece with cherry blossom branches and privet berries, to complement daringly romantic gold flatware and gold rimmed Francophile plates from Anthropologie. 2. Opt for just a hint of red. Not one for audacious declarations of love? Hint at your amorous affections with a touch of red, and pair with a delicate garland featuring tiny hearts to warm things up. 3. Match florals to the mood. Romance is definitely in the air thanks to this perfectly picked, fall-inspired bouquet. Add a certain je ne sais quoi to your rustic outdoor soiree with floral blooms in shades of merlot and burgundy. 4. Be selective and edit your decor. 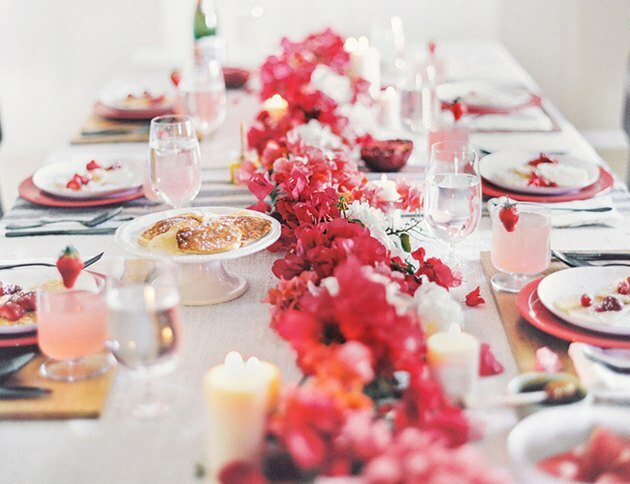 You don't need to cover your dining table in pink and red to create a romantic spread. A few carefully chosen accents — like a leafy green garland, a handwritten menu, and rose-tinted glassware — will prove your love without all the extra fuss. 5. A little sparkle and shine goes a long way. 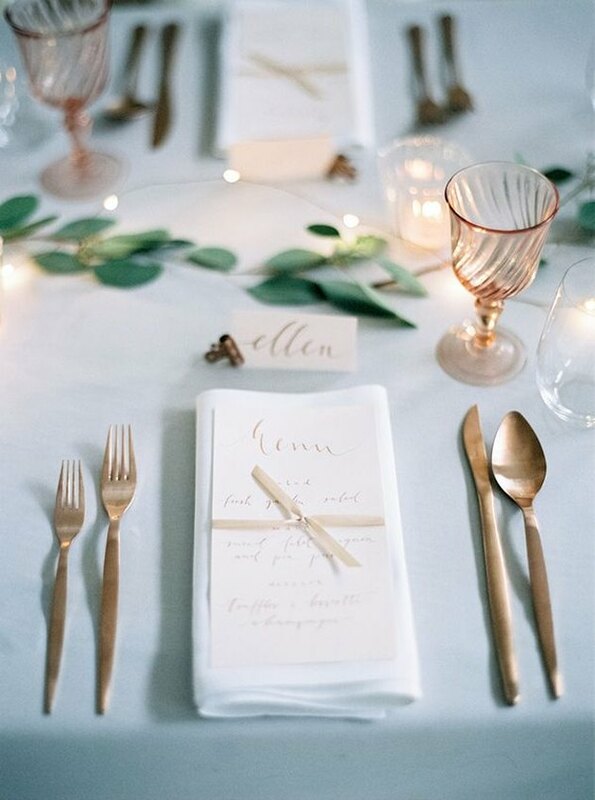 Weave a warm ambient glow into your romantic tablescape by selecting rose gold flatware, gold rimmed glassware, and gold candelabras. This blush-hued metal finish strikes the right passionate tone to beautifully convey your feelings of amore. 6. Don't be afraid to mix pink and red. You might be under the impression that pink and red don't match — but this rosy tablescape is proof positive that the two colors blend handsomely. Don't restrict yourself to one shade or another. 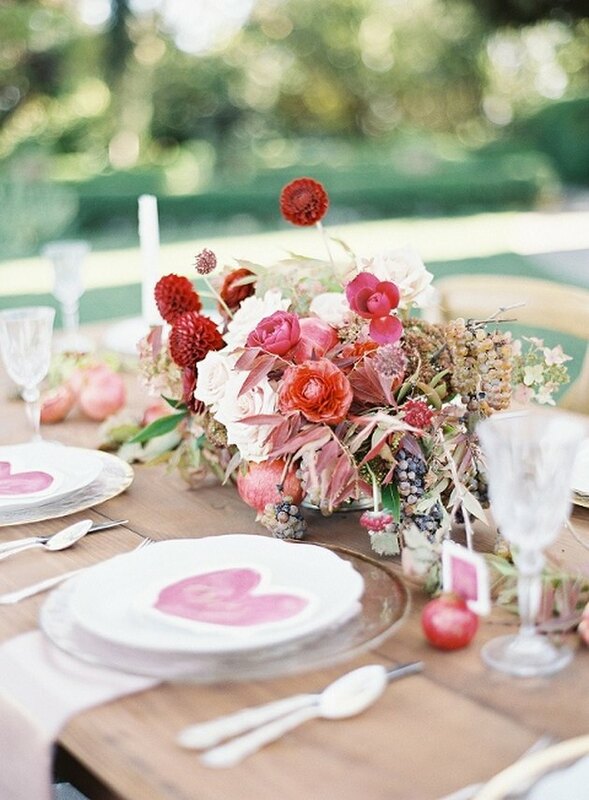 Go wild with a bevy of pink and red hues to liven up your inspiring V-Day bash. 7. Sweeten things up a bit. Start the season of love off right with something sweet like this pretty "Think Pink" cocktail by Glitter Guide contributor Carrie Waller. Your valentine will appreciate a festive aperitif to wet their palette while dining at this intimate soiree for two. 8. Napkins need love, too. Nothing says romance more than gorgeous fresh flowers. And this napkin ring DIY project from A Beautiful Mess is the perfect way to add a few more ravishing blooms to the floral repertoire. 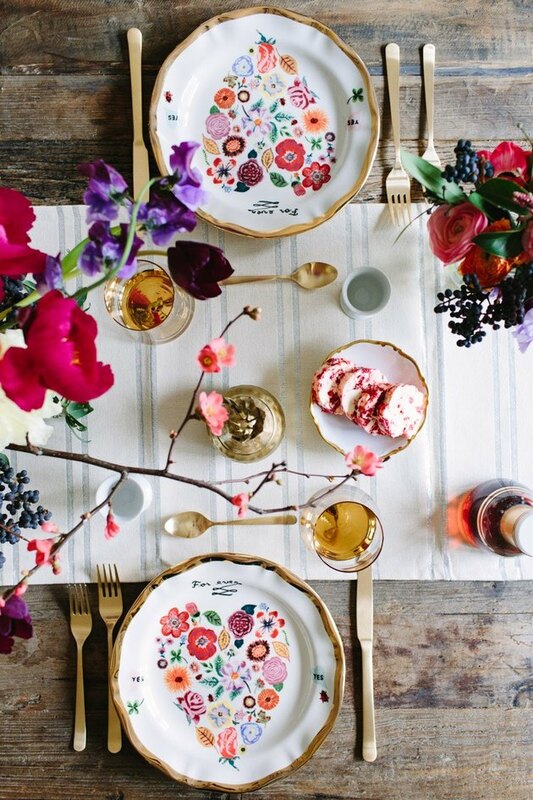 A gorgeous tablescape is a treat unto itself. 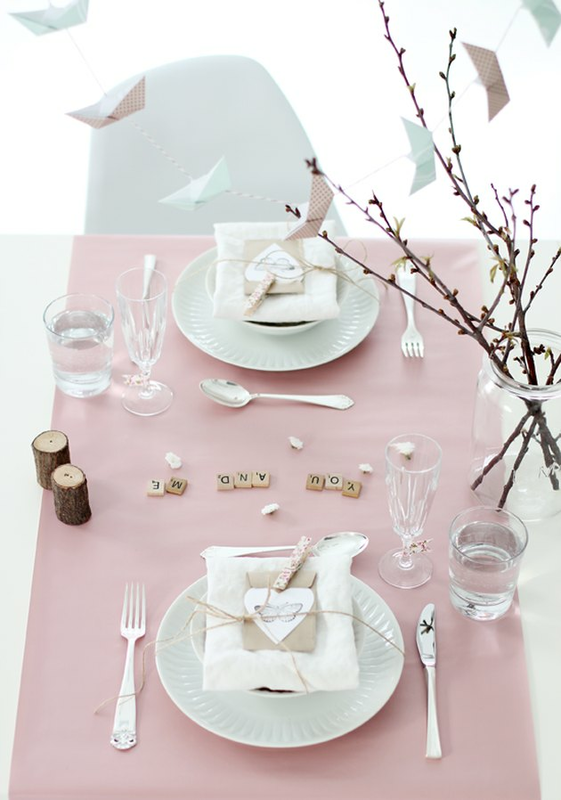 But paired with statement art — like this simple heart-shaped "Love" note — your dinner table transforms into the perfect blank slate to send a sweet heartfelt message. 10. Add a personal touch. 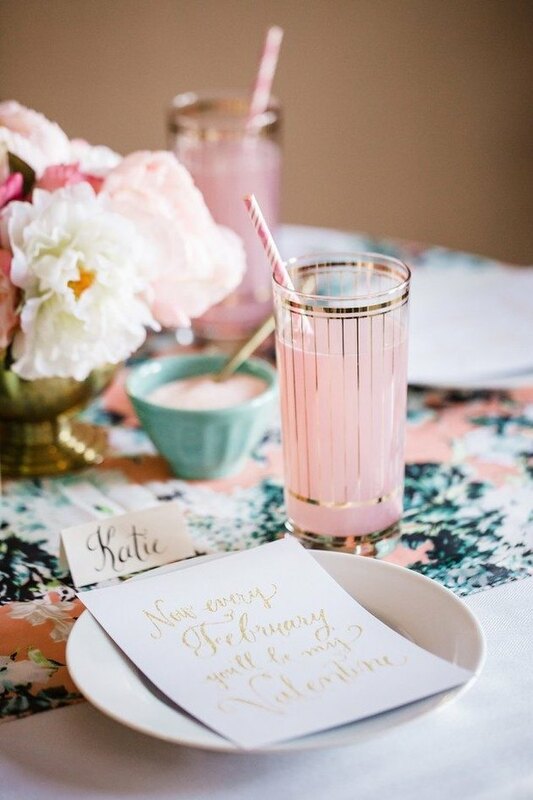 Say more with your tablescape this Valentine's Day by adding a few personal touches. 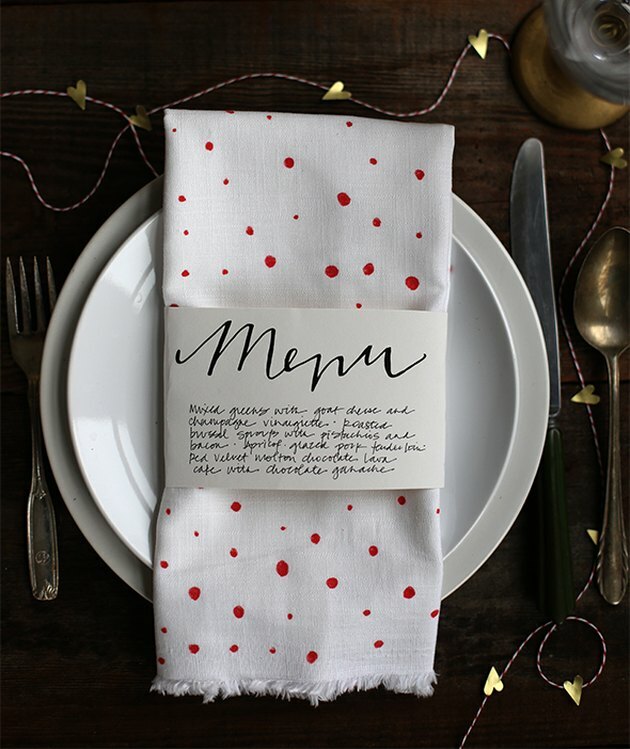 Send a message with Scrabble tiles, drop a tiny love note on each plate, or leave a wrapped token of your affection near each setting to sweeten the mood. 11. Give your soiree the glam treatment. 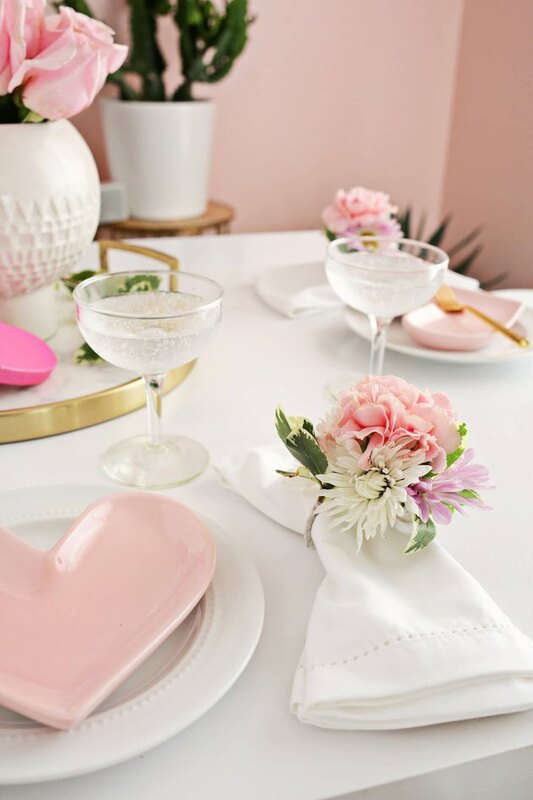 Give your dining table a little glam makeover in preparation for your girl squad get-together. 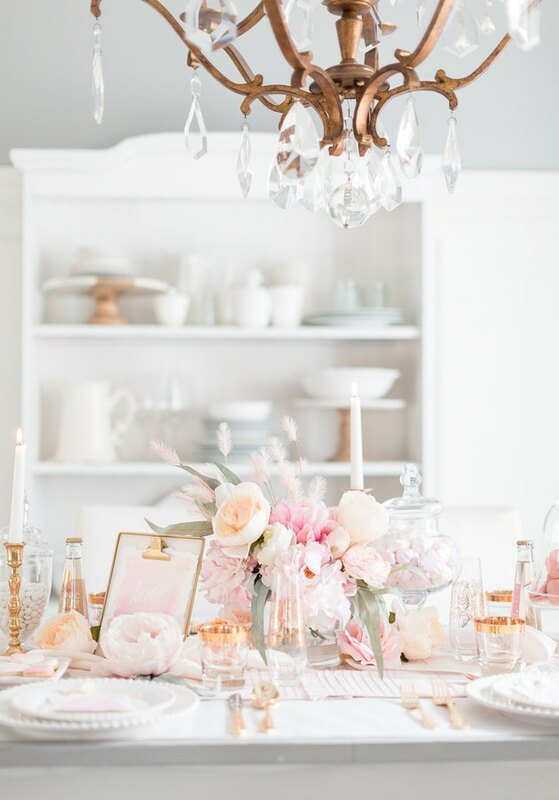 A blushing pink table cloth will make the perfect backdrop for your swanky brass cutlery, ombre-hued blooms, and decadent artisanal chocolates. 12. Or ditch the glitz and glam altogether. Who said glitz and glamour were required for romance? 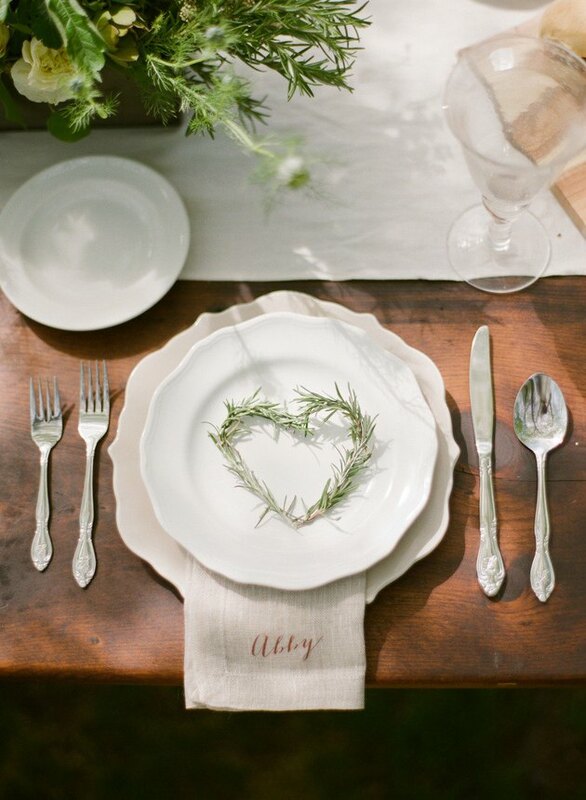 This rustic tablescape with personalized linen napkins and a heart-shaped pine tree flourish is the apple of our eye. 13. Forget the dining table, and stay in bed. 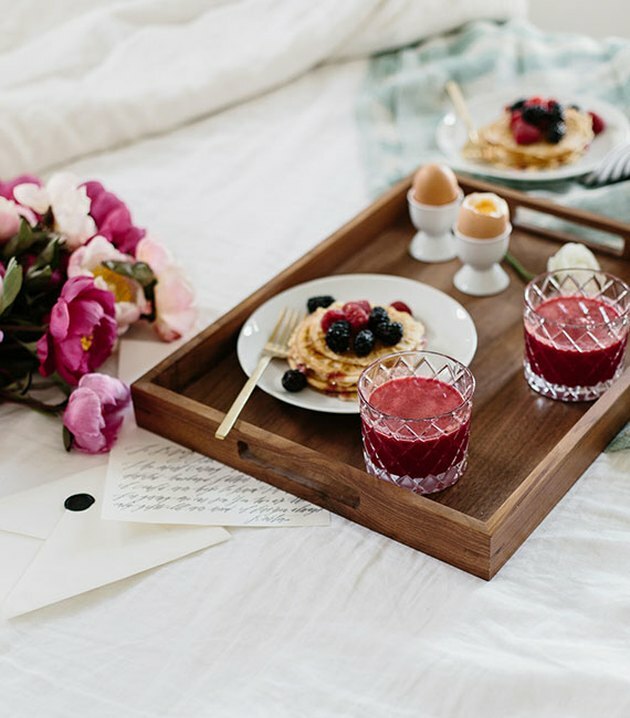 Breakfast in bed — the most romantic tablescape there is. Need we say more?